The Mexican government has sent 500 extra federal police to its border with Guatemala in anticipation of its arrival, say documents obtained by NBC News. Many of the Hondurans traveling in the caravan are children, some traveling with their parents and some without, according to the documents. Because children are afforded special protections in the United States, their arrival is creating anxiety within the Trump administration, which has pledged to decrease illegal immigration. President Donald Trump said last week that he would consider separating migrant families at the border once again, after reversing his controversial "zero tolerance" policy in June. U.S. Customs and Border Protection is tracking the caravan as the Hondurans make their way north toward the U.S. border. Meanwhile, the State Department is trying to stave off that possibility by compelling the Mexican government to stop them at its border with Guatemala. Secretary of State Mike Pompeo will travel to Mexico to meet with his counterparts on Friday, and plans to stop the caravan will be a "prominent" topic of discussion, a senior State Department official told reporters on Wednesday. "I am certain that there will be conversations in Mexico about how we can work together on this issue," the official said about the caravan. "We are certainly looking for concrete results and for solutions that work for both countries." 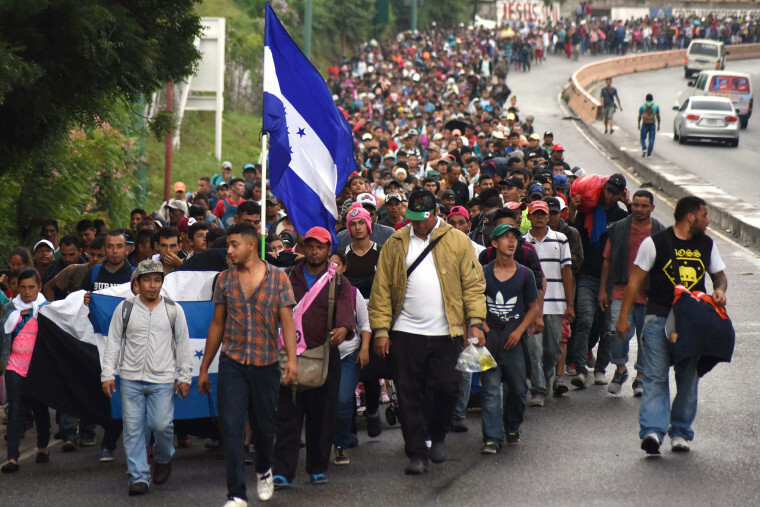 Trump has threatened to cut aid to Honduras and Guatemala if their governments do not stop the caravan. It remains to be seen what pressure the United States will put on Mexico, but a senior Homeland Security official said border agents were hopeful that State Department negotiations would significantly curb the numbers that reach the United States. The deputy chief of mission at the U.S. Embassy in Guatemala, David Hodge, arrived on Wednesday at Casa del Migrante, where hundreds of Honduran migrants continue to arrive. He told them not to continue traveling to the north. Hodge said in an interview that he was there to tell the migrants "that President Trump's message was clear — that anyone who enters the United States illegally will be arrested before being deported." "The United States government is very aware of the security and prosperity problems in the countries of the Northern Triangle, but we are investing hundreds of millions of dollars every year to improve situations," he said, referring to Guatemala, Honduras and El Salvador. "People need their future in their country, and they must return to their country," he said. Police have been sent in part to quell protesters in the state of Chiapas, which borders Guatemala, who are advocating for the safe treatment of the immigrants, according to the documents. Cooperating with the United States on strict border policies has been met with a serious backlash in Mexico, and it contributed to the election of President-elect Andrés Manuel López Obrador. López Obrador said Wednesday that when he takes office on Dec. 1, his administration will "give jobs to Central Americans. It is a plan that we have, that anyone who wants to work in Mexico will have a work visa." He said he had told Trump that he wanted to emphasize options besides deportation, including work, for Central Americans.